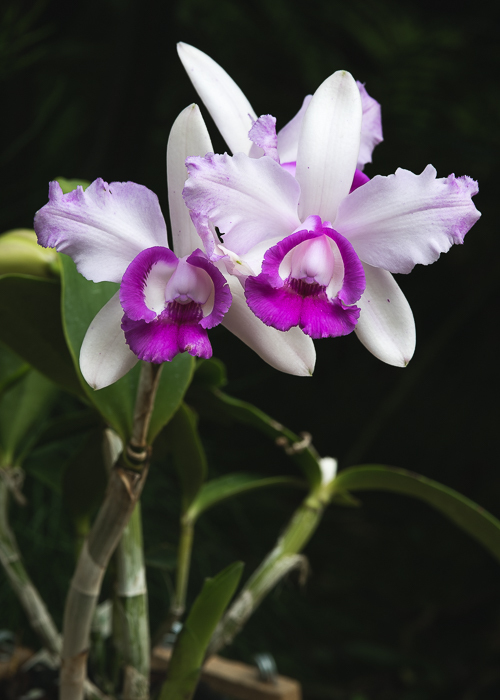 Flowering for the first time and making its debut this week in the Orchid Display House is a lovely Cattleya intermedia that we received a couple of years ago from the Brazilian nursery, Floralia. It is a horticultural variety called "marginata" that is characterized by a rich violet color on the frontal lobe and the margins of the lateral lobes of the lip. Although the plant is about half the size of the adjacent Laelia purpuratas and almost literally in their shade, it's hard to miss. It's exceptionally vibrant. And just plain cute. 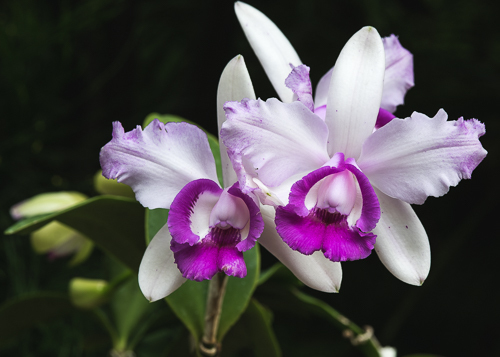 Cattleya intermedia grows as an epiphyte in Paraguay, Uruguay and the southern Brazilian states of Rio de Janeiro and São Paulo, where it favors coastal or stream-side swamps from sea level to 300 meters, often in full sun. When our plants are not on display, we grow them in very bright light in our warm greenhouse.